One of the players in my on-going Labyrinth Lord games is playing a cleric, and has chosen to be a follower of a deity called Hegg, the god of blades. He asked me if there were any special spells which he could use as a follower of this god, and, not having given the deity much thought beyond the name, I suggested that maybe we could come up with say one new spell per level, to give devotees of Hegg a little bit of unique flavour. I think that's a pretty nice system for clerics, that would give followers of each cosmic power their own noteworthy abilities, without getting into the realm of making up whole new spell lists for them all. The cleric touches a bladed weapon, which becomes enchanted for the duration, granting +1 to hit and damage. The blessed weapon does not count as magical for the purposes of striking foes which can only be hit by magical weapons. The last salvation of the god of blades, this spell brings forth a bladed weapon from thin air. Any normal type of bladed weapon can be produced. This spell imbues a single bladed weapon with divine energy, making it temporarily magical. The weapon gains a +1 magical bonus, and an extra +1 for every four levels of the cleric above 3rd, to a maximum of +5 (so, +2 at 7th level, +3 at 11th level, +4 at 15th level and +5 at 19th level). To enchant the blade, the cleric must anoint it with a vial of holy water, which is consumed. While under the effects of this spell, the subject is completely invulnerable to damage from normal, non-magical blades. The cleric gains the protection of several magical, glowing swords (one blade per two caster levels), which hang in the air by his side, ready to strike any who engage him in melee. Every time the caster is targeted by a melee attack, one of the magical swords will strike back at the opponent, hitting automatically, and dealing 1d8 damage. The target must also make a save versus paralysis or be stunned for 1d4 rounds. Once a sword has attacked it vanishes. The magical swords last for one turn per level of the caster, or until all of them have expired. Followers of the god of blades can use this spell one level earlier than normal. The cleric enchants a knife, giving it the ability to cut the fabric of reality separating parallel worlds. 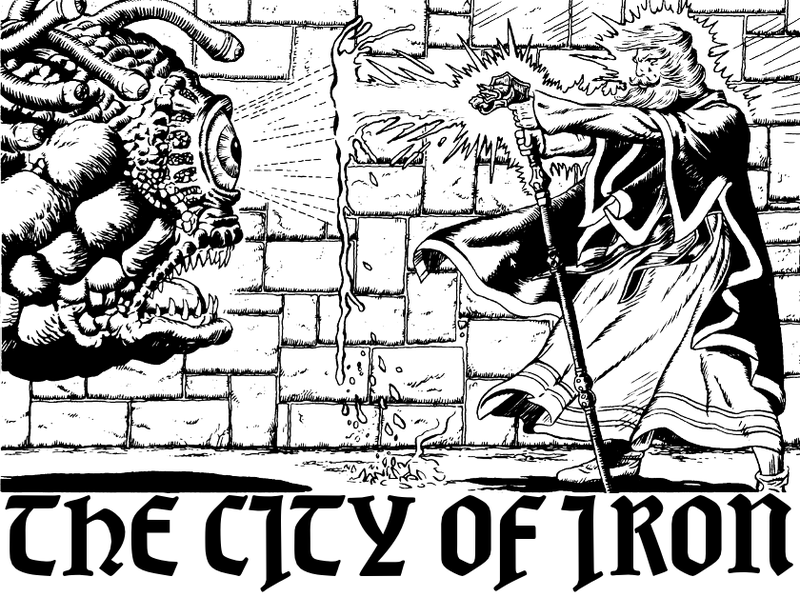 Using the knife, the cleric can cut open a doorway to another world, including, at the Labyrinth Lord's option, the various planes of existence. A single doorway can be created per use of the spell, and it remains open for one day, allowing access in both directions to any who come across it. However, the dimensional doorway cut with the knife is difficult to detect, being only visible as a thin tear in the fabric of space. Those who know its location can easily pass through, but others must make a normal roll to detect secret doors in order to find it. Swearing a mighty oath before his deity, the cleric is granted a holy avenger sword (see the AEC magical items section) for the purposes of fulfilling an epic quest. The sword is only granted if the quest is deemed of great import to the cleric's deity, and if such a powerful weapon is truly necessary. If the quest deemed worthy, the sword will last until the goal is completed. During the quest, the cleric gains the advanced benefits of the sword (usually only gained by paladins) while wielding it directly in pursuit of the goal. Such an oath is not without downsides, however, as the cleric is sworn to complete the quest with all haste. Any delay or retreat causes the sword to lose its powers, and the cleric will come under the effects of a curse, in a manner similar to the quest spell. If the cleric dies with the quest unfinished, the sword remains and may be taken up by another, who must also swear an oath before the deity and take over the cleric's role, gaining all the benefits of the sword and the urgency to complete the quest. When the quest is successfully completed the sword vanishes, its purpose fulfilled. The victorious cleric is usually granted some boon by his deity in this case. I've not mentioned it for a while, but my still-unnamed book of spells, magic-user sub-classes and miscellaneous esoteric bounty for Labyrinth Lord is coming along nicely. There are now over 200 new spells in the book! The necromancer and elementalist classes are finished. The "nature mage" (now tentatively called the Vitalist) is nearing completion. I've decided to add a bonus section on d30-based wild magic, which I'm rather pleased with and includes (so far) about 15 spells only usable by wild magic-users (which can include sub-classes such as wild elementalists or wild illusionists!). There are also a bunch of new monsters (for various summoning spells), and magic items (especially to add some necromancy-themed items, which are strangely missing in the core LL books). Continuing on from the other day's post about "Many Dwarrow, Many Rat-People", here's the remainder of the characteristics of those races. Each PC exhibits one of these. Carve hideous statues in honour of the gods of the fathomless darkness of the earth. Are sickened by acts of kindness. Are loyal and courageous to the point of foolhardiness. Find the feel of cloth unpleasant, preferring to always wear metal. Are wider than they are tall. View Law and consistency as the most important virtues, even unto death. Have a twisted sadistic streak, and make excellent torturers. Spend one month of each year in a state of deep slumber. Have more than one father. Have replaced all their teeth with metal replicas. Pity and try to guide other races, who are weak-willed and lacking in purpose. View the giving and receiving of gifts as ultimately debasing. Have the patience of a rock. Become students of history, coveting scriptures and records from ancient times. Have seen awful things in the deeps of the earth, which they are at once terrified of and lust after. Are sterile and unable to reproduce. Live by an odd conception of time, often mixing up past and future. Can detect subtle vibrations in stone, warning them of approaching or recently passed creatures. Are members of a rebellious sect which proposes tenets such as “kindness”, “equality” and “generosity”. Play a droning, melancholic music on horns and pipes. Secretly plot treason against their kin with the hope of becoming a great ruler. Have one true purpose in their lives, which was determined at birth. Keep their soul in a rock. Feel no kinship with their own people, becoming wanderers looking for a home. Are terrified of magic and those who use it. Will gladly die defending their home and people. Have a spiteful malicious streak. Speak in rhyme and riddle. Can grip small items with their tail. Can use their sense of smell to follow recent tracks. Suffer from a hunger which is never sated, and risk become obese. Refuse to eat the flesh of domesticated animals. Believe in reincarnation and that all talk of an “afterlife” is a deadly spiritual trap. Will only wear clothing of a specific favoured colour. Dream of sailing to unknown lands. Follow a mysterious spiritual path of renunciation of material wealth. Are captivated by the moon, often spending long hours gazing at it. Feel an irresistible urge to delve into the deeps of the earth. Are experts on gourmet food and fine wines. Become infuriated at the sight of waste and decadence. Find the touch of stone unpleasant, preferring the warmth of earth or wood. Can live to be over 200 years old. Are equally at home creeping on all fours as they are standing upright. Have a lust for gems and silver which rivals that of the Dwarrow. Can grip with their feet. Are of the opinion that a cosy home is the highest achievement in life. Experience a waxing and waning between extremes of personality. Are so excitable that they can rarely sit still or sleep. Give personal names to inanimate objects. 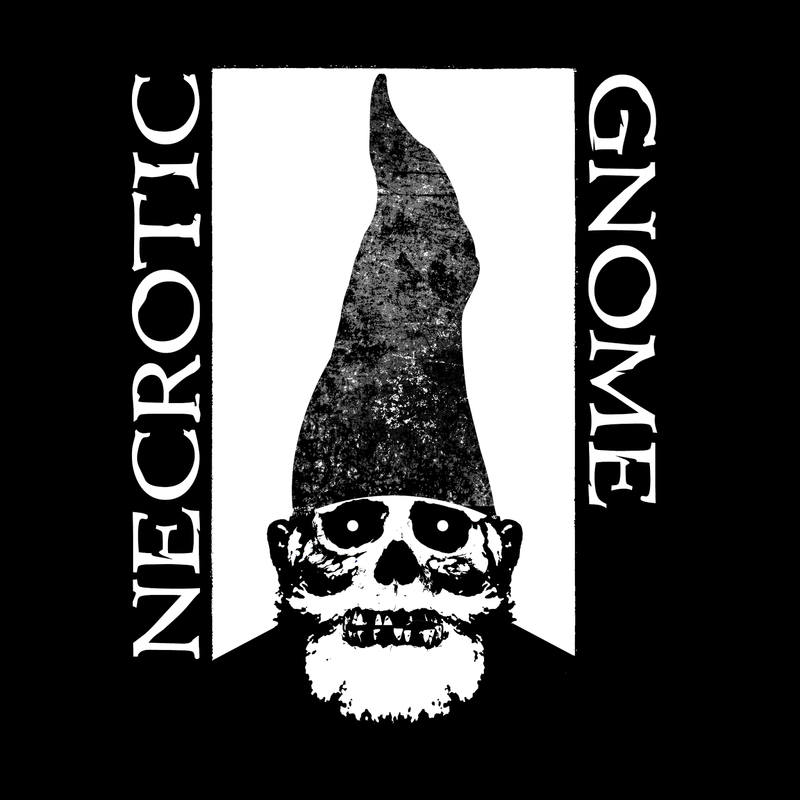 It's been brewing for some time, but is finally finished: my take on the necromancer class. It's a class that's seen many, many interpretations over the years, in all different versions of D&D, so making my own version was really just for fun. And fun it was. The class is designed explicitly for Labyrinth Lord, though of course that means it's trivially compatible with any other form of pre-d20 D&D or clones. It's worked as an equal to the standard magic-user, having the same XP and spell progression, all the way up to 9th level spells. You can download the PDF here. Over 50 new spells can be found within (including a couple of re-writes of spells of yore). One of the players in my on-going LL games is playing a necromancer at present, and the class is playing out pretty well so far, and seems well balanced in comparison to the standard magic-user. The PC is only 2nd level though, so we've not had a chance to test out the higher level spells yet! As usual, if anyone ends up using this class or any of the spells, I'd be delighted to hear how they worked out. And any feedback of any kind (well, ideally constructive ;) is also most welcome. Inspired recently by the "devil is in the details" concept developed by Kesher in Fight On!, I decided to start creating these tables of random racial features for my Old Aalia campaign. First up are two d30 tables which describe some of the most common traits of Dwarrow and Rat-People. The concept is that each newly created character of these races should roll for three of these traits. Stretch their ear lobes by hanging pebbles from them. Smoke a sweet smelling pipe-weed which is intoxicating to humans. Believe that Dwarrow are the rightful possessors of all metals and stones. Have no sense of taste. View avarice as the highest emotion. Can subsist by eating gravel alone. Worship Ogremoch, lord of the dark, cold earth, whom they view as the creator of the world. Are driven mad by the sound of music. Follow an ancient creed of 111 rules known as Bag-Hran. Dream of conquering and ruthlessly enslaving other races. Eat enormous quantities of bland food, apparently without pleasure. Carve likenesses of themselves in stone. Do not sleep but just go still for precisely 8 hours. Like to mock other races openly. Become obsessed with hoarding a certain type of item. Practice the art of counting, internally maintaining an increasing count through their whole lives. Will only sleep on bare stone. Believe that one who eats a diet of gold will live forever. Feel a kinship with a specific type of stone, determined by the auspices of their birth. Keep a small book in which they write in code. Are covered in warts and lumps, which they are secretly ashamed of. Never sweat and have completely odourless bodies. Are of the opinion that the human conception of the soul is a laughably childish attempt to mask the grim truth of reality. Have extremely long names, and up to 17 secret names reserved for specific rituals. Happily eat food which is well past its prime. Are trained in a craft of spiteful pranks to be applied to the arrogant and vain (often involving needles and irritating poisons). Superstitiously carve little animal figurines from bone and wood. Excel at poetry and riddles. Abhor the concept of slavery or service. Try to remain neutral in all disputes. Love to keep pets, which they groom and adorn with ribbons. Brew a fish-wine in odd stills made from guts. Practice a unique craft, something between sculpture and smell-art. Find humans' religious and philosophical opinions endlessly funny. Do not view theft as a crime, seeing it rather as a joke to be played on the stupid. View writing as a pointless arrogance of the “tall races”. Believe that their folk descended from the moon. Adorn their tails with rings and bells. Have no concept of marriage. Love dancing to music played on pipes and flutes. Protect their possessions obsessively and elaborately. Have an acute sense of smell, and make no differentiation between pleasant and foul. Have no understanding of the concept of nobility. Shave spiral patterns from their fur. Have a detailed and on-going alternate life in their dreams, in which they are usually slaves. Practice a wide array of fortune-telling techniques. Believe that it is an honour to bestow equal favour and disfavour upon others. Ok so as planned I've finished off the annotations on the campaign map, and added some sites of special interest. These are represented by numbered stars on the map. The sunken palaces of Garm. Fastness of the giant king. Grbla -- City of the swine-folk. Feremhaal -- City of statues. More details on these, and the other locations on the map, to come! 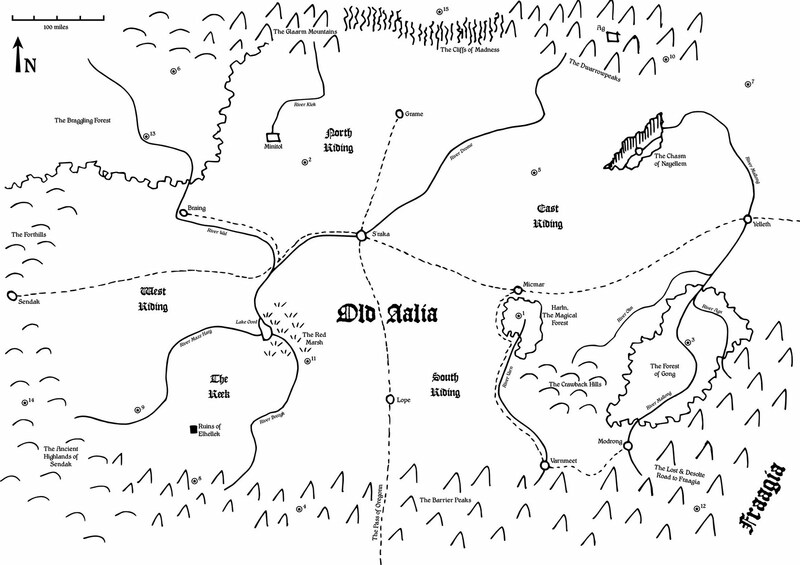 Here's an almost-finished version of a new campaign map I'm working on. The original was drawn in coloured pens, then scanned in, cleaned up in Gimp, and vectorised and text added in Inkscape. The next step will be adding some more "sites of interest" to the map. I have a list of about 15 unusual locales (potential sites for adventures), which I'll probably add to the map simply as numbered stars or something like that. Finally I need to write up snippets of info about each of the cities and adventuring locales to give the players some hints as to what's what. The map I posted previously, of the Harln-Halladan region, can be seen just to the right of the text "Old Aalia" in the new larger scale map. I just remembered an excellent post I saw somewhere ages ago, but which I now can't for the life of me track down. 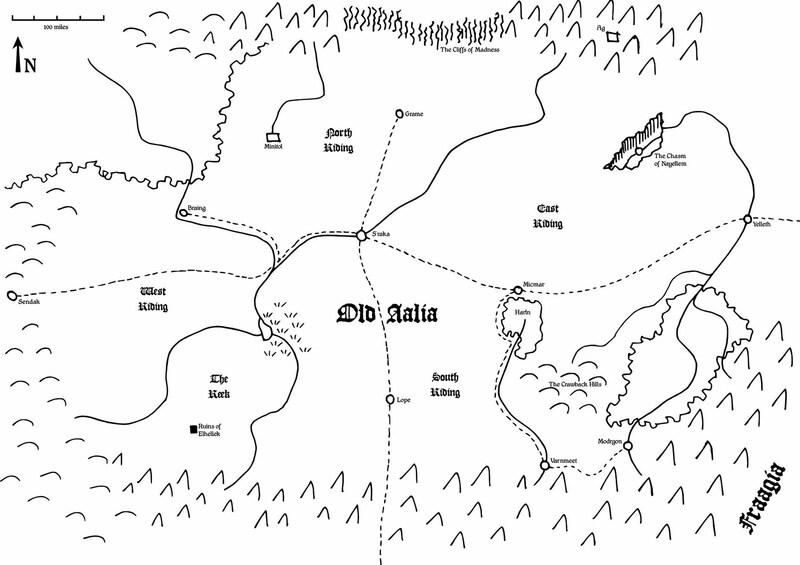 It was a method of fleshing out a campaign world and simultaneously producing nice bits of interesting background for characters. The idea was that for each race you have a set of tables like "most halflings X, Y, Z", "some halflings A, B, C", "rarely halflings J, K, L", and so on. That's the gist of it, I just can't quite remember the details. If anyone knows where to find it, please do let me know! Casting this spell and touching a body part causes it to detach from its owner, who can then control the part as an independent entity. Thus hands may crawl around, legs may hop, and even heads can be detached and rolled. The detached body part can be controlled for up to 1 turn per level of the caster, after which it must be retrieved and reattached to the body (which happens automatically). If the body part is not reattached during the spell's duration it dies. Using the reverse version, graft, body parts lost in any way may be replaced either by reattaching the missing part or by grafting on replacement parts cut from another living or recently dead creature. The graft is permanent, but the recipient (which may be the caster himself) must make a transformative shock roll. If the roll fails the graft does not take, and will wither and fall off in 1d6 weeks. 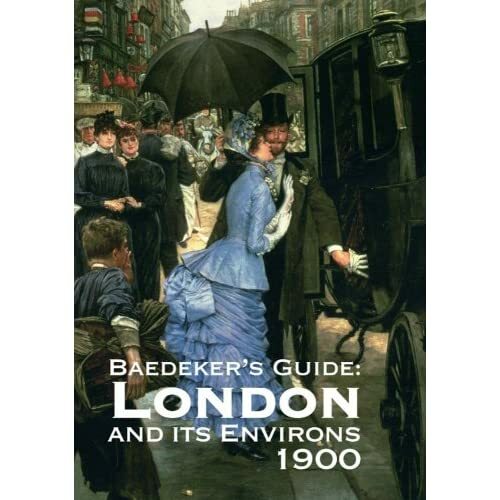 A little recommendation for anyone interested in running games in Victorian London: I've just been doing a bit of research on sourcebooks for the period, and discovered the wonderful looking "Baedeker's London and its Environs 1900". It's a hardback facsimile of a real guidebook from the time, and is readily available from amazon etc. And it's 512 pages, so I imagine it's pretty comprehensive! 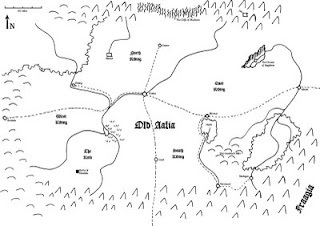 Originally I was looking for something specifically RPG related, possibly the out-of-print "Cthulhu by Gaslight", but really I just want a book with detailed maps, and information about notable places, where one can buy things, and so on. It looks like this book will be perfect for the job! I just ordered it, so will post further information as to its RPG-worthiness when I receive it. The really great thing is that I've only played CoC twice, and both times the d20 version, so this majestic tome is all new to me!